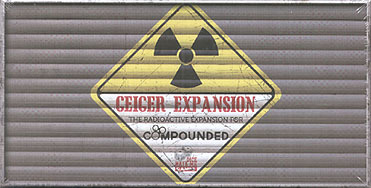 The Geiger Expansion gives experienced scientists even more to consider in the Compounded lab with the introduction of radioactive elements and compounds. Scientists will have to keep a close eye on the Geiger counter, because as productivity in the lab increases, so does the chance for radioactivity levels to soar dangerously high. The Geiger Expansion also includes wooden flame and radioactivity tokens, 10 scientist cards that grant abilities to individual players and the lab, and even a solo variant where you need to stop a scientist from sabotaging the lab! This expansion requires the Compounded base game to play.